A nice sixth plate ruby ambrotype featuring a resolute yankee private armed with a rifle with fixed bayonet. He stands at attention wearing a frock coat and the distinctive havelock hat made by Purinton & Ham of Dover, New Hampshire most commonly seen on early New Hampshire volunteers. 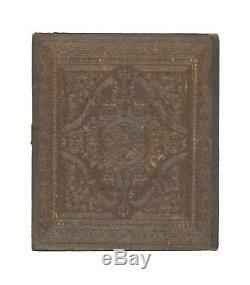 The image comes housed in a leather half case and is in excellent condition. Please see my other items for more interesting and original Civil War pieces. 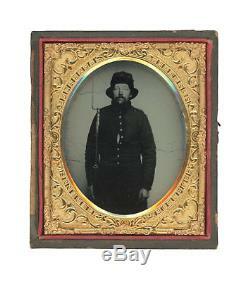 The item "1/6 Plate Civil War Ruby Ambrotype Armed New Hampshire Private with Havelock Hat" is in sale since Saturday, August 25, 2018.